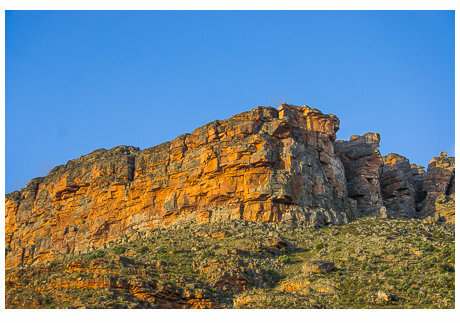 The area known as “The Cederberg” starts about 90 minutes’ drive north from Cape Town, is a vast rocky wilderness creating a natural playground for walkers, climbers, campers, photographers, artists, and all lovers of nature. The mountains reach over 2,000m in places, and even the more modest ones are spectacular as they stand out against clear blue skies. 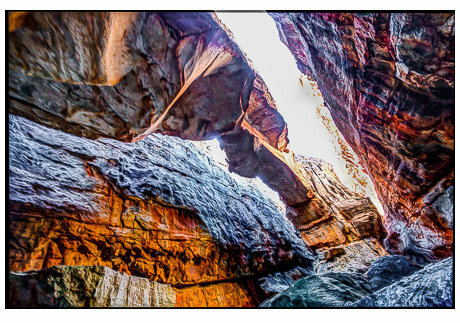 Over the years the elements have worked on the mountain ranges to create shapes and contortions that challenge description – faces, birds, prehistoric monsters, arches, all in the fiery colours of the sandstone from which they are made. 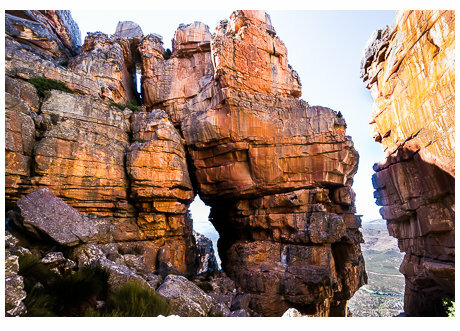 There are many famous formations amongst which the Wolfberg Arch and Maltese Cross stand out, the latter a rock pillar standing over 9m tall, like some ancient totem pole. 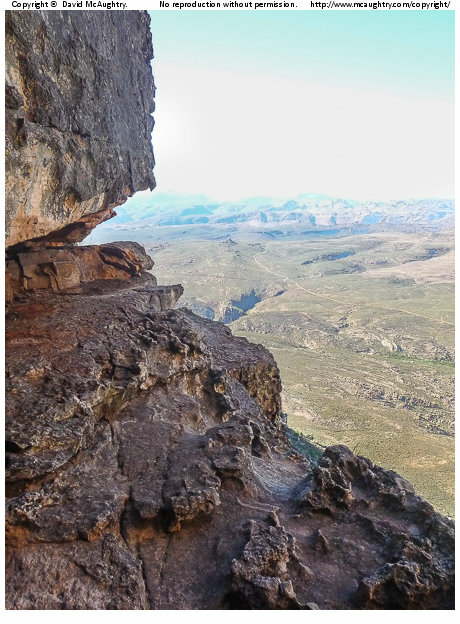 P*tt* (my DLW) and I have stayed in the Cederberg on a couple of occasions, and I have hiked to the Maltese Cross, a 3 or so hour round trip, but the Wolfberg Arch is a more serious proposition, taking approximately 8 hours according to the guidebooks. It is also not a hike to do alone. So, with David planning to come out to Cape Town in November, the opportunity arose for us both to tackle this celebrated hike. 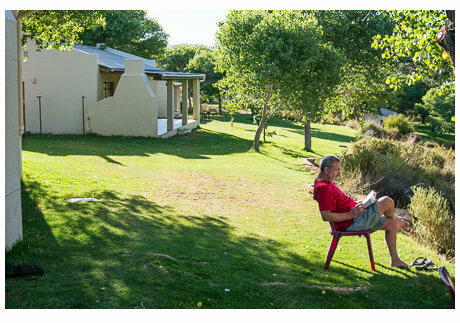 We agreed to drive up the day before, and leave ourselves the whole of the next day to complete the hike and enjoy the scenery without having to rush back to Noordhoek that night. 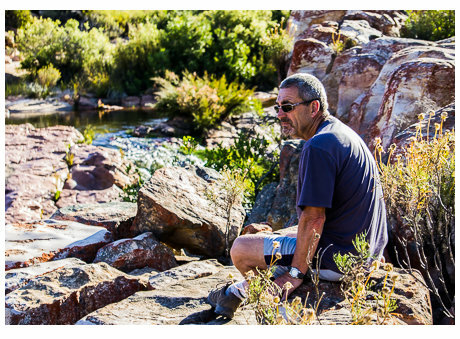 Access to the walk is from the Sandrift Resort, a campsite with comfortable chalet accommodation overlooking the Matjies river. We arrived at Sandrift in time to take in a wine tasting at the nearby Cederberg Winery (until recently the highest winery in the country at 1,000m, and a producer of extremely fine wines! 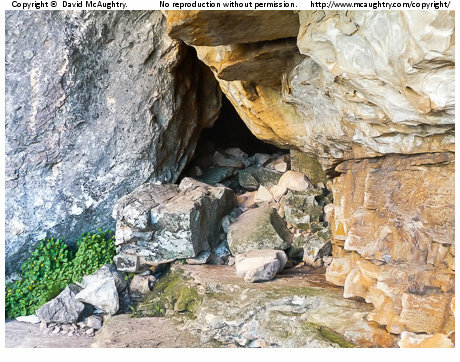 ), followed by a walk through the adjacent Lot’s Wife area, a gentle trail through a maze of rock formations including the eponymous Lot’s Wife rock formation. After checking into our chalet we walked along the river to the Maalgat Pools, a series of beautiful rock pools in the river, which are wonderful to swim in on a hot summer day, and then took a bottle of something chilled to watch the sun hit the reddening rocks at the aptly named Valley Of The Red Gods. On previous visits with P*tt*, I had similarly quaffed a sundowner, looking up at the Cracks that mark the real beginning of the trail to the Wolfberg Arch. It is very hard to pick out the zig-zagging footpath that leads to the Cracks, even with binoculars. It is impossible to imagine what route the trail takes thereafter! The naked eye can see the Cracks easily enough, but one would never be able to imagine the scale of the imposing rock faces, nor the length of journey that this pathway through the Crack entails. 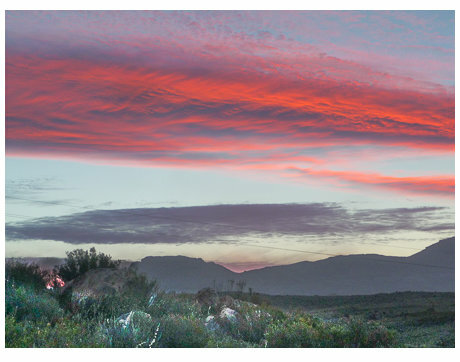 We had picked up a brochure from the Cederberg Winery shop that describes the route to the Arch, and found some of the descriptions a little intimidating, but reasoned that they were deliberately on the dramatic side. Not so, as we would discover! Back at the chalet David went in pursuit of sunset pictures, as the sky took on amazing colours with the evening cloud coming in behind the mountain range to the west. The braai was lit, the meat was cooked and the wine was drunk. An early start beckoned the next day. By 6:45am we were at the start of the trail. What follows is a reproduction of the description of the route as published in the ‘Hiker’s Companion’ pamphlet, with accompanying notes and comments in italics. The Hike “Take the path from the parking area and follow it until you reach a huge boulder with a smooth face, shaped somewhat like a pill-box, lying directly on the path. You are now about 2/3rd the way to the cracks, after approximately 40 – 50 minutes walking. From here the path continues up then veers left to reach the foot of the huge rock walls soaring high above your head. The path then hugs the foot of the wall for a while, then, as you approach the huge hanging prow, starts clambering over small boulders. Shortly after, you will reach the foot of the Cracks. To this point, you will have taken 1 hour to 1 ½ hours since leaving the car park. 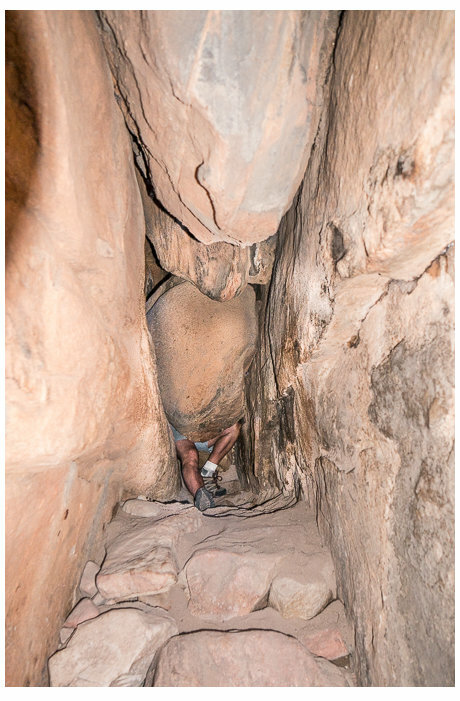 The huge wide crack to your left is the Wide Crack, and the little brown sign at the foot of the rock wall on the right points to the start of the Narrow Crack. 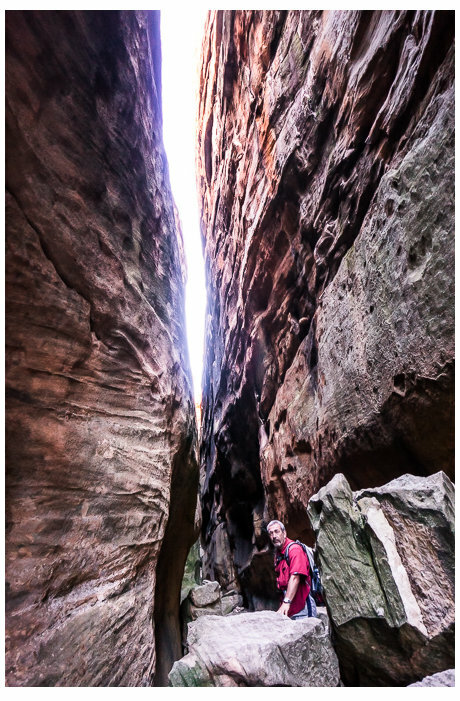 You can choose to go up through the Wide Crack but if you are up for a challenge, the advice is to ascend via the Narrow Crack and take the Wide Crack on your return. 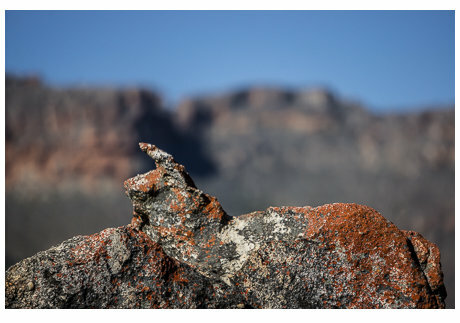 If you don’t you will miss out on one of the most awe-inspiring places in the entire Cederberg Mountains. ” Difficult decisions lay ahead! Neither of us felt like being foolhardy: this is wilderness country and an accident could have serious consequences. And yet…..the message was clear. You must at least try the Narrow Crack! This second route seemed impossible, so the hole to nowhere was the only option! In the event, with some scraped knees and elbows, it was no problem…rather fun actually! Hmm, this was a bit more worrying. However the handholds were good, and the footing was secure, but a slip didn’t bear thinking about! Well, we had come this far so we resolved to carry on. We could still have turned back, but that meant doing the traverse again, and that crawl through the hole in the cliff. “This is a good place for a rest before tackling the rest of the Narrow Crack. Look across the gully and you will see a pillar and some dark entrances in the wall on the opposite side. Head for the left-hand entrance, where a large cairn and arrow scratched on the wall marks the correct entrance, which is slightly triangular in shape. This is the start of the Narrow Crack proper.” Okay, we were committed now! These arches were really impressive. Each span was around 50m long and 30m high – and seemed to almost fly above us. Coupled with the incredibly deep colours and the sense of awe and tranquility, this for us was the absolute jewel of the Wolfbergs. 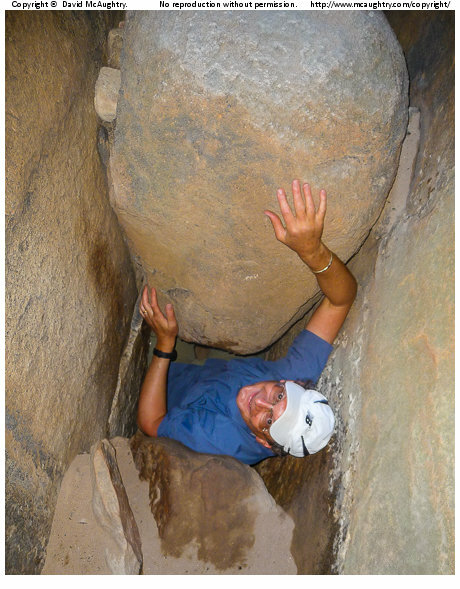 “Scramble over the boulders and past the two arches to reach twin passages leading onwards. Take the left passage and follow this impressively narrow 30 metre high corridor (the sides of the passage were almost touching each other at the top of the cliff walls) for a few 100 metres….. 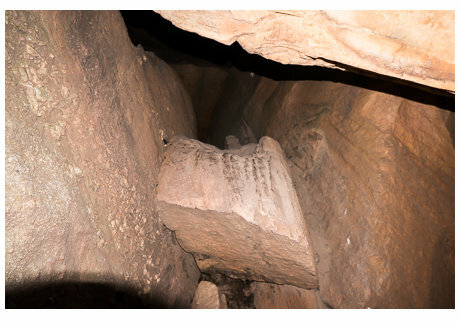 The chockstone is shown on the left – the perspective isn’t obvious, but the camera is looking upwards – the stone is wedged in the crack walls, about 9 feet up and is about 1 cubic metre in size. Both sides of the crack were absolutely smooth. This looked like trouble. No handholds were obvious, and there was absolutely no way to crawl under the chockstone. Oh, just read the instructions! “Climb up over the chockstone, putting your back against the left-hand wall and your feet on the other. Wriggle up to reach the good handholds above on the right-hand wall. You will need to pass rucksacks up at this step. Yup, that worked. This was fun! “Once past this you get to the squeeze hole: once again rucksacks must be removed. Crawl underneath the chockstones, lying on your back on the sandy floor and, head first, wriggle along and squeeze through the gap to stand up on the other side. 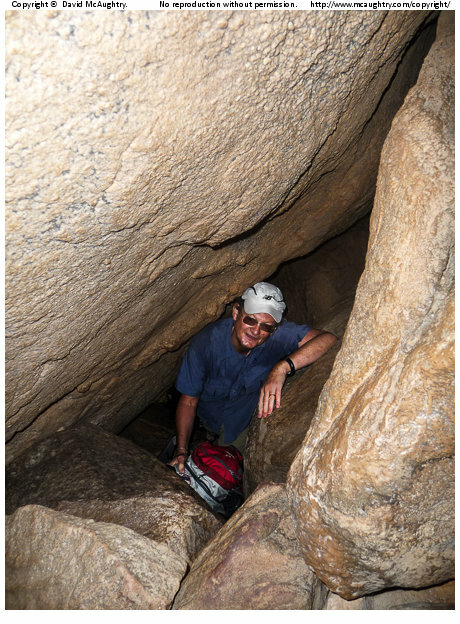 This is not particularly tight, albeit a little awkward, but a large person would be advised to climb up over the chockstones before the squeeze hole.” Reading this after the trek it sounded daunting. Looking at it now was it still looks daunting. But, following the instructions to the letter, it was fine. Quite an adventure. A ‘large person’ would very definitely struggle, and climbing over the obstruction did not look at all easy. Not recommended for anyone suffering from claustrophobia or trying to keep their clothes clean. “After this, you are nearly at the top. Continue up the fairly eroded path past a gnarly tree root embedded in the rock to top out on the upper plateau. Stop for a well-deserved cup of tea!” WOW, that was an amazing 90 minutes. Physically quite strenuous, but completely exhilarating, with breathtakingly beautiful sights. Really glad we took the Narrow Cracks route. We speculated that most people probably didn’t, taking the easier Wide Crack both ways. “This next section of the walk was the longest, but easiest, as there was very little change in height, until the last stage before reaching the Arch. Even that was pretty gentle. We did (very) narrowly miss stepping on a Puff Adder, but that was the only drama. Every step of the way is a photographer’s dream, which may have accounted for the 3000+ pictures David took, and the extra hour it took us to complete the walk. 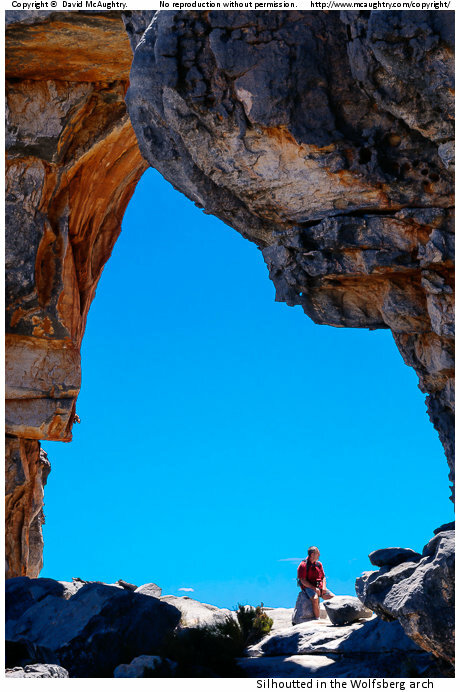 The Arch is spectacular, and, as with the Cederberg in general there is a real beauty to the desolation. We did meet two other walking groups, a young man and woman from France, and another couple from Norway and somewhere else. And yes, they too had come through the Narrow Crack! (In fact, we have yet to meet anyone who didn’t!) The walking conditions were ideal. Not too hot, maybe mid 20’s, and a good breeze to cool us down. Descending via the Wide Crack “From the top of the Narrow Crack follow the path to reach a green Cape Nature signboard. Take a sharp left here and a left again at the nearest opportunity, heading back in the same direction you have just come from. Soon you will pass a small brown sign saying “Cracks” and, soon after, another one. From here just keep on the oath, which leads down the Wide Crack to join the path that takes you down the main slope to the car park.” Confusingly there is another apparent entrance to the Wide Crack to the right of the real one : we soon realised that this is impassable! “You are advised to keep to the left side of the crack, where it broadens in the mid and lower sections. Near the bottom end of the crack is a series of large rock slabs, ideal for lunch or just a rest to admire the view down the valley.” By now it was time for ‘lunch’, and we sat on a wonderful, very exposed, slab of rock looking down to the vineyards and farmland several hundred feet below. 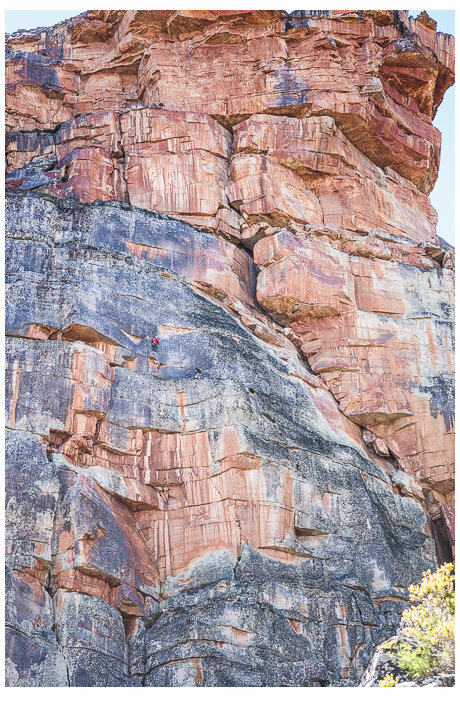 The photo to the left shows climbers on the rock face shown at the beginning of this post (3rd one down). It gives you some idea of the scale of these massive guardians to the Wolfberg cracks. Look for the little red dot, about halfway down the rock face. “Back to the car park The path is exactly the one that you took on the way up.” However this time it will hurt your knees! All told the walk had taken us about 7 hours, as opposed to the estimated 8, so we had done pretty well for a couple of old farts. It had been a fabulous experience, unlike any walk that either of us had done. We could have driven back home that afternoon in the event, but a bit of R&R reading and making use of the nearby river was welcome before the fire was lit and another innocent piece of meat was charred and a bottle of the local produced consumed. Cheers David, that was a great day! A wonderful few days – and a tribute both to M*rt*n’s great organisational abilities, and to the extraordinary walking that is possible in the Western Cape. In the next post I’ll put up some more photographs of the extraordinary sights we saw along the way.